One day in May 2011, during the peak of Greece’s financial crisis, Alekos Sideris and his coworkers at Vio.Me, a producer of industrial adhesives in the northern city of Thessaloniki, were greeted with grim news. The management’s parent company, Philkeram Johnson, had once been a profitable enterprise, employing 350 people and exporting ceramic tiles to 29 countries. Now, saddled with $5.3 million in debt, it was filing for bankruptcy, and Sideris and his 69 colleagues would all be flung into the job market in a country where more than one in five people were already without work. After more than a year of delaying paychecks, the company was ready to close up shop and walk away, despite owing more than $1.7 million in debts and compensation to its employees. After months of failed negotiations with the Ministry of Labor, and unsuccessful appeals to central trade unions for help, the remaining workers of Vio.Me cast a vote—and by upwards of 97 percent, they agreed to reopen the factory and run it on their own. By February 2013, the production line was up and running again, but it was now churning out new products: eco-friendly soaps, detergents, and fabric softeners. Today, the Greek government, currently led by the left-wing Syriza party, is celebrating what it calls the end of the economic crisis. On August 20, the country will officially exit the European bailout program, but the working class, which has been devastated by a decade of crippling austerity measures—including pension cuts, shrunken wages, and tax hikes—has little cause for rejoicing. Unemployment still hovers around 20 percent, part-time work is on the rise, and the minimum wage has decreased by about one-fifth since the beginning of the crisis. Against that backdrop, workers across the country, including those at Vio.Me, fear their own crisis is far from over. Vio.Me’s history is one of a gradual evolution from a desperate response to impending layoffs to a radical experiment in self-management. And the 23 remaining workers say they have created a model that can help struggling workers fight back in the face of yet more hardships. Drawing inspiration from factory occupations in Argentina in the early 2000s, they abolished hierarchy, creating a structure based on the idea that all workers are equal. Unlike many cooperatives, which maintain a hierarchical structure, Vio.Me’s staff now share responsibilities such as cleaning and guarding the premises, and each employee makes the same hourly wage. A general assembly has replaced bosses. Before the occupation, Sideris played a single role at the factory, unpacking incoming materials and loading outgoing shipments. Today, workers rotate in their duties and responsibilities, having learned from one another how to perform tasks they hadn’t done in the past. “You have so much to give and receive, and the knowledge and experience is transferred from one person to another,” he said. After discussions with the surrounding neighborhood, Vio.Me stopped producing things that required harmful chemicals, switching to the eco-friendly cleaning and hygiene products for which they are now widely known. Hoping to play a positive role in the community, they also established a health clinic to provide services for both the workers and other crisis-struck Greeks living in the surrounding area. Challenges mounted early on, though, and they were forced to navigate a slew of legal and bureaucratic obstacles. Perfecting recipes for their products was a challenge. Lacking access to traditional markets, Vio.Me had to rely on a network of activists and supporters known locally as the “solidarity economy.” Cutting out distributors, they sell via an online store, at left-wing political festivals, and directly to their clientele: everyday Greeks, mom-and-pop stores and green-friendly cooperative businesses. This model brings in comparably smaller revenues, however, and Vio.Me still finds it is hard to compete with larger, traditional companies. Additionally, as was the case for thousands of shuttered factories across the country, the property on which Vio.Me sits was put up for auction. To add to the complications, although they registered the Vio.Me brand, the workers didn’t have a legal claim to the equipment and machines, and some of it was repossessed. Authorities came several times to turn off the electricity, but solidarity activists from the area mobilized and blocked entry to the factory. Eventually, the unemployment benefits ran out, as well. The barriers remain numerous, though, and the threat of eviction always looms. The premises are expected to go back on the auction market in September, where the reduced price could attract potential buyers keen on investing in the broader property. Vio.Me sits on one-fifth of the total land up for sale, and the workers fear the property’s purchase could provide a bank-appointed liquidator with the immediate political authority to kick them out once and for all. At lunch, a handful of Sgouras’s compatriots gathered for a shared meal of sesame seed–blanketed bread dipped in olive oil. On the office walls were anti-fascist flags, posters proclaiming solidarity with the Zapatista Army of National Liberation and with various worker-led actions across the globe. Dario Azzellini, coauthor of Ours to Master and to Own: Workers Control from the Commune to the Present and a professor at Cornell University, said that factory takeovers are “something that workers have always been doing” during times of political upheaval, class struggle and war. While Vio.Me stands out as the most successful initiative of its type, it has built strong ties with other anti-austerity movements in Greece, and with occupied and self-managed workplaces in other countries from Europe to Latin America. In 2015 and 2016, Vio.Me workers rallied to distribute humanitarian aid to refugees bottlenecked on the country’s northern border. They enjoy close relationships with squats and cooperatives across the country. Many of those projects are now under attack, while others were quashed as part of the Greek government’s crackdown on opposition to the austerity regime. In 2013, with the right-wing New Democracy party heading the government, steps were taken to close down ERT, the state-run broadcaster. In response, the station’s reporters and operators occupied the studio and maintained a 24-hour broadcast. They kept control of ERT for five months, until riot police finally raided and evicted them. Syriza came to power in 2015 on promises of abandoning austerity, but critics say the government has reneged on its campaign pledge. 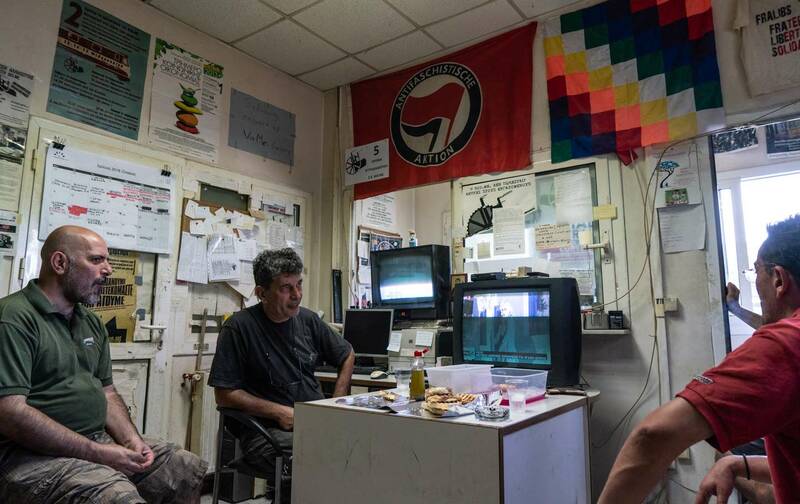 Under Syriza’s watch, authorities have increasingly targeted occupied spaces, including left-wing and anarchist squats that serve as social centers, health-care providers, and residences for Greeks and refugees alike. This March, police stormed three squats in Athens, kicking out the inhabitants and arresting a dozen activists. But a wave of solidarity has saved some occupied spaces, at least for the time being. City Plaza, an activist-occupied hotel that provides residences to some 350 refugees and migrants, has managed to avoid eviction by rallying supporters for large protests, and physically blocking authorities from cutting off their electricity and water. When the government moved forward with plans to evict the Metropolitan Community Social Clinic in June, the occupied health-care center received, according to the clinic, “an unprecedented show of support from individuals and organizations” in Greece and beyond. Protests were staged in Greece and outside its embassies in other countries. More than 130 doctors, academics, trade unions, and politicians from across Europe wrote angry letters to the Greek government. A German member of the European Parliament, Rebecca Harms, called on the European Union’s legislative body to intervene. In response, the Greek government backtracked, postponing the eviction and offering to relocate the clinic to a new building as a compromise. Back at Vio.Me, the workers believe this brand of grassroots support is their best shot to keep the project alive, but they are also open to compromise. If the property is sold, they propose that the government legalize their presence on the part of the property where their facilities sit.